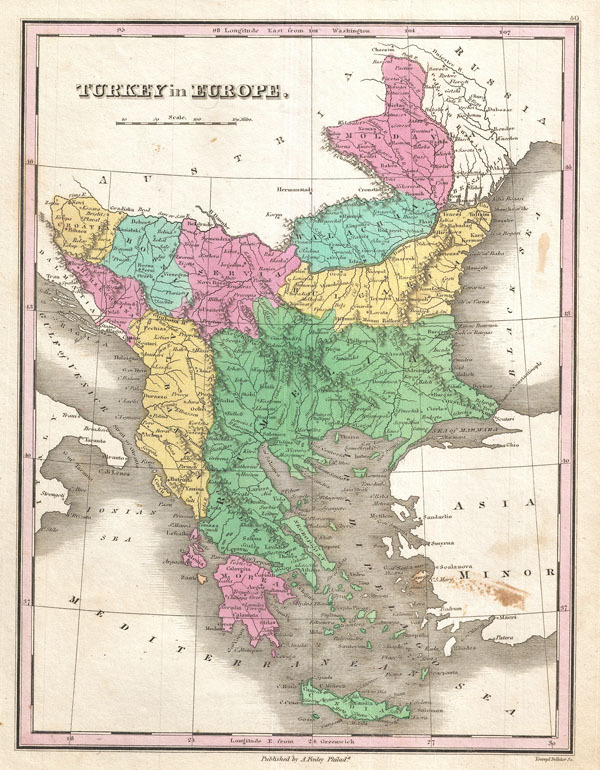 A beautiful example of Finley's rare 1827 map of Turkey in Europe. Covers the European lands claimed by the Ottoman Empire in the early 19th century. This includes the modern day nations of Greece, Macedonia, Albania, Croatia, Bosnia, Serbia, Bulgaria and Moldova. In Finley's classic minimalist style, this map identifies cities, forests, river systems, swamps and mountains. Color coded according to regional political boundaries. Title and scale in upper left quadrant. Engraved by Young and Delleker for the 1827 edition of Anthony Finley's General Atlas. Rumsey 0285.051 (1831 edition). Phillips (Atlases) 4314, 760, 752, 6045.